1. Be able to state how certain properties of atoms vary based on their relative position on the periodic table. One of the reasons the periodic table is so useful is because its structure allows us to qualitatively determine how some properties of the elements vary versus their position on the periodic table. The variation of properties versus position on the periodic table is called periodic trends. There is no other tool in science that allows us to judge relative properties of a class of objects like this, which makes the periodic table a very useful tool. Many periodic trends are general. There may be a few points where an opposite trend is seen, but there is an overall trend when considered across a whole row or down a whole column of the periodic table. Many of the periodic properties of atoms depend on electron configuration; in particular, the valence electrons and their level of attraction to the nucleus. Where Z is the nuclear charge (equal to the number of protons), and S is the screening constant which can be approximated to the number of non-valence, “core” electrons. Approximate the effective nuclear charge of magnesium. First we must determine the electron configuration of magnesium to determine the number of core electrons. Mg =1s2 2s2 2p6 3s2 = [Ne]3s2, therefore magnesium has 10 core electrons from its 1s2, 2s2, 2p6 orbitals. Magnesium is element 12, so it has 12 protons and a nuclear charge of 12. 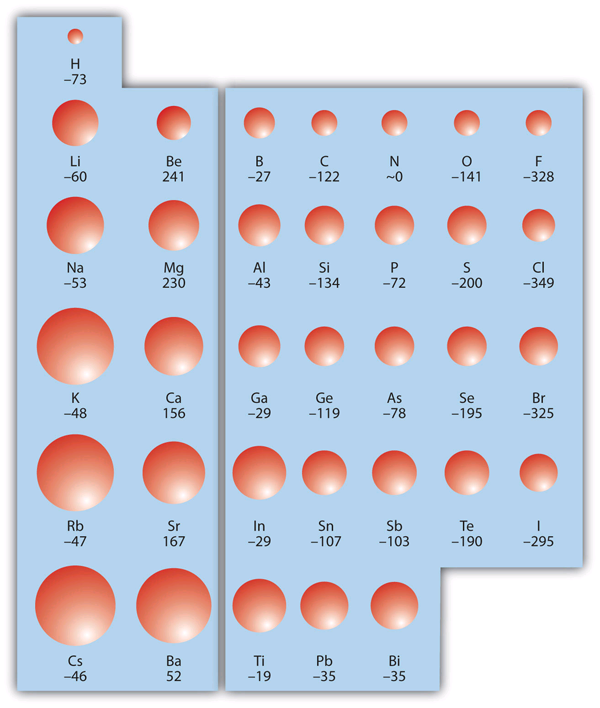 Moving left to right across a period on the periodic table, each subsequent element has an additional proton and valence electron, but the core electrons which are responsible for the majority of screening remain the same. This results in a trend that in general the effective nuclear charge increases from left to right across any period of the periodic table. Figure 8.22. The periodic trend for effective nuclear charge. The atomic radius is an indication of the size of an atom. Although the concept of a definite radius of an atom is a bit fuzzy, atoms behave as if they have a certain radius. Such radii can be estimated from various experimental techniques, such as the x-ray crystallography of crystals. Figure 8.23 “Atomic Radii Trends on the Periodic Table” shows spheres representing the atoms of the s and p blocks from the periodic table to scale, showing the two trends for the atomic radius. 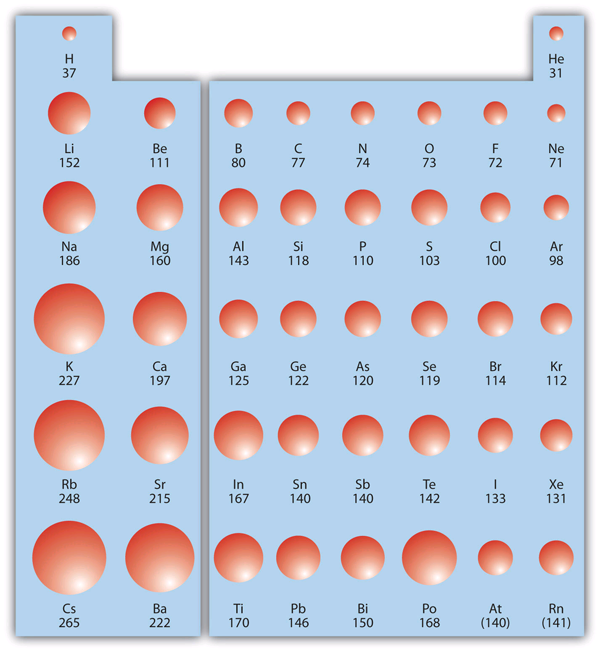 Although there are some reversals in the trend (e.g., see Po in the bottom row), atoms generally get smaller as you go across the periodic table and larger as you go down any one column. Numbers are the radii in pm. Referring only to a periodic table and not to Figure 8.23 “Atomic Radii Trends on the Periodic Table”, which atom is larger in each pair? Si is to the left of S on the periodic table, so it is larger because as you go across the row, the atoms get smaller. S is above Te on the periodic table, so Te is larger because as you go down the column, the atoms get larger. Referring only to a periodic table and not to Figure 8.19 “Atomic Radii Trends on the Periodic Table”, which atom is smaller, Ca or Br? Figure 8.24 “Ionization Energy on the Periodic Table” shows values of IE versus position on the periodic table. Again, the trend isn’t absolute, but the general trends going across and down the periodic table should be obvious. The second IE is twice the first, which is not a surprise: the first IE involves removing an electron from a neutral atom, while the second one involves removing an electron from a positive ion. The third IE, however, is over five times the previous one. Why is it so much larger? Because the first two electrons are removed from the 3s subshell, but the third electron has to be removed from the n = 2 shell (specifically, the 2p subshell, which is lower in energy than the n = 3 shell). Thus, it takes much more energy than just overcoming a larger ionic charge would suggest. It is trends like this that demonstrate that electrons are organized in atoms in groups. Which atom in each pair has the larger IE? Because Sr is below Ca on the periodic table, it is easier to remove an electron from it; thus, Ca has the higher IE. Because K+ has a positive charge, it will be harder to remove another electron from it, so its IE is larger than that of K. Indeed, it will be significantly larger because the next electron in K+ to be removed comes from another shell. Which atom has the lower ionization energy, C or F? There is not a definitive trend as you go down the periodic table; sometimes EA increases, sometimes it decreases. Figure 8.25 “Electron Affinity on the Periodic Table” shows EA values versus position on the periodic table for the s– and p-block elements. The trend isn’t absolute, especially considering the large positive EA values for the second column. However, the general trend going across the periodic table should be obvious. Predict which atom in each pair will have the highest magnitude of EA. C and F are in the same row on the periodic table, but F is farther to the right. Therefore, F should have the larger magnitude of EA. Na and S are in the same row on the periodic table, but S is farther to the right. Therefore, S should have the larger magnitude of EA. Predict which atom will have the highest magnitude of EA, As or Br. Certain properties—notably effective nuclear charge, atomic radius, IE, and EA—can be qualitatively understood by the positions of the elements on the periodic table. Write a chemical equation with an IE energy change. Write a chemical equation with an EA energy change. State the trends in atomic radii as you go across and down the periodic table. State the trends in IE as you go across and down the periodic table. Which atom of each pair is larger? 6. Which atom of each pair is larger? 7. Which atom of each pair is larger? 8. Which atom of each pair is larger? 9. Which atom has the higher IE? 10. Which atom has the higher IE? 11. Which atom has the higher IE? 12. Which atom has the higher IE? 13. A third-row element has the following successive IEs: 738; 1,450; 7,734; and 10,550 kJ/mol. Identify the element. 14. 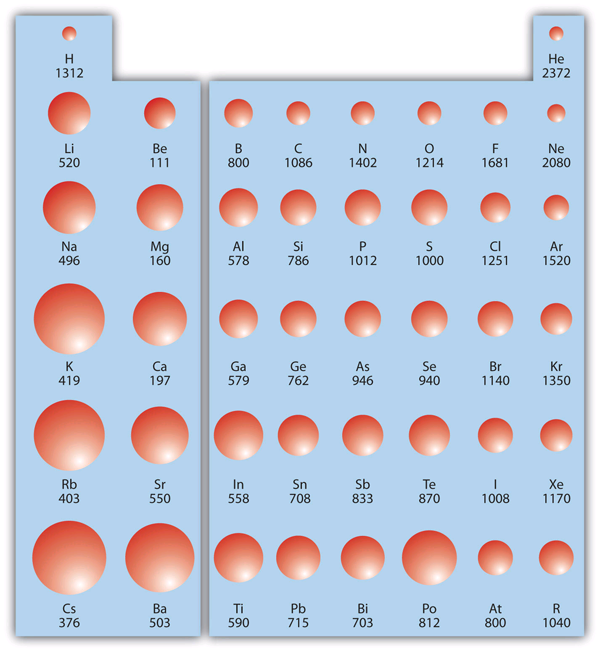 A third-row element has the following successive IEs: 1,012; 1,903; 2,912; 4,940; 6,270; and 21,300 kJ/mol. Identify the element. 15. For which successive IE is there a large jump in IE for Ca? 16. For which successive IE is there a large jump in IE for Al? 17. Which atom has the greater magnitude of EA? 18. Which atom has the greater magnitude of EA? As you go across, atomic radii decrease; as you go down, atomic radii increase. The third IE shows a large jump in Ca. Periodic Trends by David W. Ball and Jessie A. Key is licensed under a Creative Commons Attribution-NonCommercial-ShareAlike 4.0 International License, except where otherwise noted.